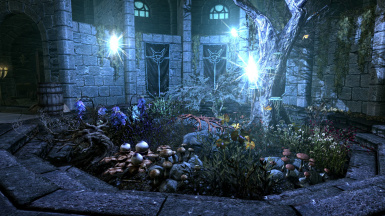 Fixes bugs relating to harvestable objects in Skyrim. - Workaround for the flora respawn bug. - Hawk's nest now uses the correct mesh instead of the Rock Warbler nest. - Mountain Flowers and Bird's Nests have been given distinct names. - Coin purses will release pedestal pressure plates when "taken." - Made the Mora Tapinella that had no harvested state (meshes/landscape/plants/treepineforesthollow01mshrm01.nif) disappear when harvested. - Made hanging rabbits, pheasants, horker, and charred skeevers disappear when harvested. - Not compatible with, and intended as a replacement for Flora Respawn Fix. - Minor conflicts with any other mod that changes the same meshes I did. Mostly I would recommend letting that mod overwrite this one. No critical changes were made to meshes this version. - Any mod that adds new flora, or makes changes to existing flora or tree forms, will need a patch to attach my script or else those flora will still have the respawn bug. - Since version 2.0 this mod requires SKSE 1.7.2 or newer. - All official DLC is required (except the HD textures.) I may eventually make separate version for the base game and DLC, but it will be a low priority unless there are a number of requests for it. I don't have a lot of time for modding anymore and that would be extra work for little if any benefit. - Unofficial Skyrim Legendary Edition Patch http://www.nexusmods.com/skyrim/mods/71214/? - Wiseman303's Critter Fixes http://www.nexusmods.com/skyrim/mods/54485/? - Wiseman303's Trap Fixes http://www.nexusmods.com/skyrim/mods/55100/? - For games that have not had Flora Fixes or Flora Respawn Fix installed. - No special steps are necessary. Install manually or with the mod manager of your choice. - For upgrading from an existing install of Flora Fixes v1.x or Flora Respawn Fix. - Download the FloraSaveFixer tool (v2.0 or later) from the Miscellaneous section of this mod's nexus page. - Run FloraSaveFixer on the save you wish to continue from. - Install the new version of Flora Fixes normally. - Flora that has an enable parent may have a slight delay before resetting to it's unharvested state when you enter the cell or load a save. This is due to a limitation in SKSE. For those interested in the technical details read the article on this mod's nexus page. - Improved sanity checking in one of the scripts. - Removed edits to the flora version of the Sleeping Tree Sap Spout, which wasn't actually used in-game. - Plugin is now flagged as a master file for improved patch support. - Complete rewrite. Now works on existing saves. FloraSaveFixer tool only needed for switching from Flora Respawn Fix or an earlier version of this mod. - Added harvest animations to all harvestable dead animals. - Gave distinct names to the two Birds' Nests. - Respawn timers are now reset if the cell is visited before respawn time. This should keep things synchronized with the rest of the cell reset. - Script improvements to reduce log spam about activate parents. - Yellow Mountain Flowers now have distinct names as well. - Mountain Flowers now have distinct names. - Fixed broken script on Sleeping Tree Sap Spout. - Mesh patches contributed by x0ne to include fixes from Mindflux's Particle Patch for ENB. - Minor script tweak. Plants that have an animation added after they are harvested will appear harvested next time the cell loads. - Hotfix for Soul Husks. - Bethesda for the base meshes I modified. - bluedanieru for starting me on the path of making this mod. - Please do not re-upload this mod anywhere else. You may use assets from this mod in your own unpaid mods, credit appreciated. - I would also appreciate you contact me if you use any of my work in your own mod, so I can see what you made with it. - Use of resources credited to other authors requires their permission separately.